Discover This Season at the Palau. You’re Going to Love It! 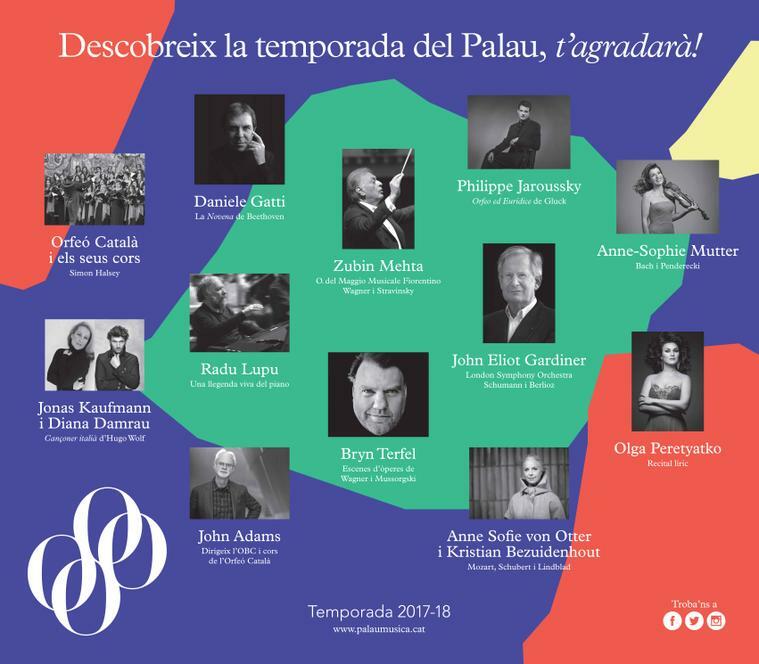 The 2017-18 season sees the Palau de la Música Catalana become a space to discover and enjoy music! The arrival of Simon Halsey as Artistic Director of the Orfeó Català choirs and Artistic Advisor at the Palau, posts he has occupied since 2016, has given a fresh boost to the choral family of the Orfeó Català. Under his leadership, this season the choirs will tackle significant challenges together, with new repertoires and following great conductors and performers. For instance, the Orfeó, the Cor de Cambra, the Cor Jove and the Cor de Noies will star in the first European performance of Considering Matthew Shepard, composed by Craig Hella Johnson and considered to be a modern revision of the Passion, which aims to become a space for reflection and musical enjoyment (21.10.17). Another challenge is the debut in Spain of The Monster in the Maze by Jonathan Dove, which will be performed by all the choirs in a coproduction with Barcelona’s Festival Grec. The work, which highlights the refugee crisis, was co-commissioned by Sir Simon Rattle and Simon Halsey (15.07.18). The traditional Sant Esteve concert will, as always, be another highlight in the season and is programmed with perennially renewed excitement to offer several debuts (26.12.17). Alongside these committed projects, we must mention the participation of the choirs in concerts under the direction of great conductors. For the second time, Sir Simon Rattle will conduct the Orfeó Català, although it will be the first occasion on which he will be directing a choir a cappella. This performance will precede the concert by the Berliner Philharmoniker in the Palau 100 cycle, a concert organised by BCN Clàssics in collaboration with the Palau (08.06.18). Zubin Mehta will also direct the Orfeó Català for the second time with another concert in the Palau 100 dedicated to choral scenes from operas by Wagner with the Orchestra del Maggio Musicale Fiorentino along with a performance of Igor Stravinsky’s The Rite of Spring (09.04.18). Another great conductor, Daniele Gatti, who recently directed a successful tour of Beethoven’s Ninth Symphony around Italy with the Orfeó and the Cor de Cambra, will present the same work again in the Palau 100 cycle, this time with the formations of the Palau performing alongside the Mahler Chamber Orchestra (26.04.18). Likewise, the Palau’s Cor de Cambra will once again collaborate with the Ensemble Matheus and Jean-Christophe Spinosito offer an energetic and luminous reading of Vivaldi’s Gloria, also in Palau 100 (03.04.18). For the first time, the Palau’s professional formation will perform alongside Mark Padmore, who recently appeared at the Palau with sublime interpretations of Schubert’s three great cycles, in a concert for the Palau Grans Veus (Great Voices) in which the choir and tenor will shine with pieces by Schubert and Britten (14.03.18). Finally, we must mention the participation of the formation in a concert with the countertenor Philippe Jaroussky, who returns to the Palau following his fantastic performance last November. As part of Palau 100, this season he will be performing Gluck’s Orpheus and Eurydice (05.06.18). In addition to these notable concerts, the choirs will perform in their regular Cicle Coral Orfeó Català – the Cor de Cambra cycle, in which the formation will be directed by renowned conductors – and in a series of concerts under the epigraph La Casa dels Cants (The House of Song). Apart from these concerts, which bring together the combined performances of the Escola Coral, there will be a participative concert in which the Orfeó will invite singers from all over the world to rehearse and sing the Carmina Burana under the direction of Simon Halsey (11.02.18). The star cycle of the Fundació, Palau 100, will be rounded off with other essential concerts, such as the performance by Isabelle Faust next to Il Giardino Armonico and Giovanni Antonini, with a selection of Mozart’s Violin Concertos. Composed between 1773 and 1776 in Salzburg and debuted by the Austrian genius himself, they are the most extrovert and technically complex pieces of all his works (19.10.17). Leading his Collegium Vocale, Philippe Herreweghe begins a project spanning four seasons at the Palau with the interpretation of one of the most notable works in the history of music: Monteverdi’s Vespro della Beata Vergine, with which the Palau closes the commemorations marking the 450th anniversary of the birth of the composer from Cremona (23.10.17). In a concert organised by BCN Clàssics in collaboration with the Palau, the great Viktoria Mullova and the Bamberger Symphoniker will present the Concerto for Violin and Orchestra by Sibelius (10.11.17). Anne-Sophie Mutter will perform in the Sala de Concerts with pieces by Penderecki, Brahms’ last Violin Sonata and the celebrated Violin Partita No. 2 by Bach, which includes “Chaconne”, one of the peaks in the history of music (17.11.17). It will be a privilege to enjoy performances by two of Spain’s most international figures once more: Javier Perianes and Pablo Heras-Casado. They will be appearing with one of the best orchestras in the world, the Munich Philharmonic, with Bartok’s Piano Concerto No. 3 and Dvořák’s extraordinary Symphony No. 7 (12.02.18). The beloved Sir John Eliot Gardiner will return to the Modernist stage, this season accompanied by the London Symphony Orchestra to perform a programme centred around Schumann as well as Berlioz’s delicious Summer Nights cycle (06.03.18). The Palau will once more welcome favourite artists, such as Faust, Queyras and Melnikov, who represent the heights of passionate modern performance, with Schubert’s Trout Quintet (19.03.18). Radu Lupu, one of classical music’s living legends, will also make one of his rare public appearances right here in Barcelona (10.05.18). This will be closely followed by a performance developed from the Palau’s ongoing relationship with William Christie and Les Arts Florissants, who will perform Haydn’s The Creation (14.05.18). In the fourth edition of the Palau Bach cycle,which revises the work by the Cantor of Leipzig and its context, cellist Steven Isserlis – at the height of his career – will perform a selection of pieces from Bach’s Suites. He will be following a performance of Bach’s Musical Offering by Rinaldo Alessandrini and his beloved Concerto Italiano ensemble (29.11.17). For the first time, Jordi Savall will be conducting Handel’s Messiah (20.12.17) and Marc Minkowski, accompanied by his ensemble Les Musiciens du Louvre, will perform Bach’s St. Matthew Passion (28.03.18). Benjamin Alard and Thomas Dunford will proceed with interpretations of the pieces for harpsichord and lute by J. S. Bach respectively (07 and 08.02.17 and 08.05.18). Finally, Matthias Goerne will appear with the Freiburger Barockorchester and Juan de la Rubia on the organ for a magical evening with Bach’s cantatasand Handel’s organ concertos (01.05.18). The Palau Cambra is dedicated to music in miniature and invites some of the best known formations from the current panorama of chamber music, including the Cuarteto Quiroga, who will perform one of the favourites from the chamber repertoire: Schubert’s Death and the Maiden Quartet and Black Angels by Crumb (02.10.17). Leonidas Kavakos and Enrico Pace will offer the third instalment of the Beethoven’s Sonatas for Violin and Piano (02.11.17) while the Schumann Quartet will perform pieces by Pärt, Mozart, Schubert and Glass (01.02.18). In addition, the Trio Ludwig will present the last concert from Beethoven’s Piano Trios (16.04.18). For enthusiasts of the tinkling of the ivories, the Palau Piano cycle includes dates with renowned pianists such as Khatia Buniatishvili (10.10.17), Piotr Anderszewski (08.11.17), Elisabeth Leonskaja (05.02.18), Grigory Sokolov – who returns to move his faithful following afresh for the tenth consecutive time – (28.02.18), Rafał Blechacz (13.03.18), the debut in Barcelona of Igor Levit (02.05.18) and a performance by Jean-Efflam Bavouzet (24.05.18). The Palau Grans Veus or Great Voices cycle increases the number of concerts this season to present seven recitals by today’s most sought-after voices. Following a nineteen-year absence from the stages of Barcelona, Bryn Terfel will make his debut at the Palau (06.04.18). At the Palau’s request, he will be performing two of the great scenes from the history of opera: Wotan’s Farewell and Death of Boris. This season will also see the Palau debut of the soprano Olga Peretyatko (31.05.18), one of the new queens of the Met, with a highly demanding repertoire for a light lyric soprano. The tenor Piotr Beczala, whose performance was acclaimed on 7th March 2017, will return next season with pieces by F. Tosti and Neapolitan songs (02.02.18). Similarly, Jonas Kaufmann and Diana Damrau, two of the most appreciated voices from the operatic firmament, will appear together to offer a magisterial interpretation of Hugo Wolf’s Italian Songbook (24.02.18). We must also highlight the presence of Anne Sofie von Otter, one of the most fascinating voices in recent decades, who will appear with Kristian Bezuidenhout to perform works by Mozart, Schubert and Lindblad (09.01.18). In April, the Univers Flórez will return to the Modernist stage with the appearance of tenor Juan Diego Flórez (17.04.18). In addition to all the concerts listed above, this year the spotlight on contemporary production will fall on John Adams and Albert Guinovart, our guest composers this season. The Palau aims to bring their music to a wide audience and help to broaden the public’s references with the discovery of a new repertoire. John Adams (Worcester, USA, 1947), one of the most widely appreciated and performed composers of classical music in the world, has been invited to the Palau de la Música Catalana to celebrate his seventieth birthday. As a tribute to his work, part of his catalogue will be revisited in two concerts over a single weekend. The first, in Palau 100, will be conducted by Adams himself and performed by the Palau’s own choral formations and the OBC. Among the pieces they will be interpreting is Harmonium, a demanding work which Adams has directed on many occasions since its debut (26.05.18). The second concert will form part of the Palau Cambra and will feature the Attaca Quartet (27.05.18). In addition, the Orquestra Simfònica del Vallès will perform Adams’ work in a concert for the Simfònics al Palau. The other great protagonist of the season will be Albert Guinovart (Barcelona, 1962). A very well-rounded musician, his work has led him to very diverse fields, from the interpretation of the classical repertoire around the world to the composition of musicals, soundtracks and abundant symphonic chamber music, choral pieces and varied orchestrations. His work, which makes a strong connection with the audience, will be present throughout the Palau’s 2017-18 artistic season. Furthermore, the Cor Jove of the Orfeó Català and the Orquestra de les Illes Balears will debut his Rèquiem (28.01.18) as part of a tour which encompasses Mallorca, Menorca and Girona. In addition, the Orquestra Simfònica del Vallès, Núria Rial, the ONCA, Laia Masramon, the Quartet Alart, the Dalia Quartet and the Cor de Cambra Femení Scherzo will be performing his work, often with Guinovart himself at the piano. Finally, the composer will also demonstrate his talent as a pianist with a recital for Palau Piano, which will include pieces by Chopin, Liszt and Rachmàninov as well as his own works (24.01.18). Tickets and tailored package offers (Abonaments a Mida) will go on sale to the general public on 31st May.